The 2019 Dutch Star is fit with a cargo liner, 5/8” floor decking, 5/8” bead foam, and galvanized sheeting to prevent distortion. Lengths, heights, widths, and dry weights are approximate. Weight will vary based on optional equipment added to the base weights listed below. Specifications are supplied by each chassis manufacturer. In addition, Dutch Star is supported by our ultra-durable STAR Foundation for a quieter ride. A 450-horsepower Cummins® diesel engine and Comfort Drive™ adaptive steering is standard. 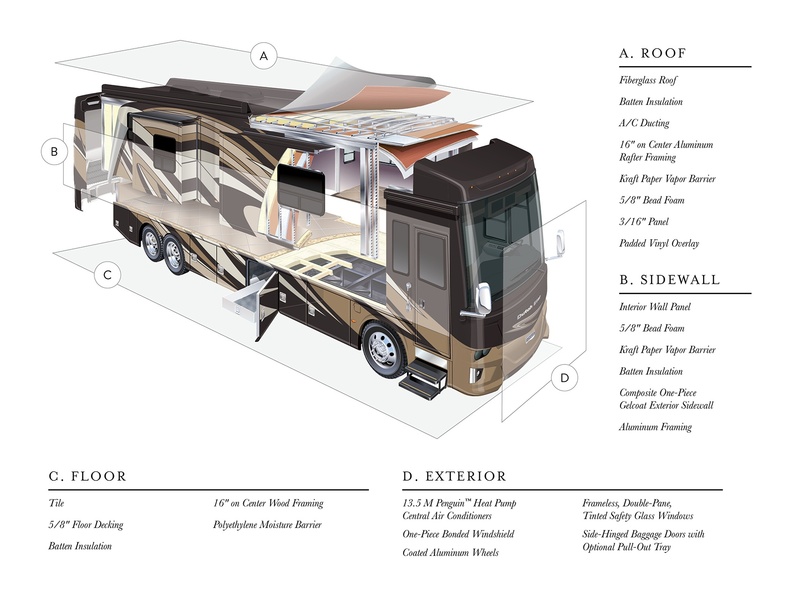 Passive Steer tag-axle technology is included with 40- and 43-foot floor plans. Like a fine home, the 2019 Dutch Star is framed 16 inches on center, and is covered by a fiberglass roof with walkable decking and an integrated gutter rail. Click or tap for more details. 3717 Cummins L 450 1250 8.9 Liters 4.78 100 gal. Allison 3000MH 6 10 242 Michelin 10000 5000 500 60 0 15200 lb. 24000 lb. 0 lb. 39200 lb. 49200 lb. 34000 lb. 5200 lb. 3736 Cummins L 450 1250 8.9 Liters 4.78 100 gal. Allison 3000MH 6 10 242 Michelin 10000 5000 500 60 0 15200 lb. 24000 lb. 0 lb. 39200 lb. 49200 lb. 34500 lb. 4700 lb. 4002 Cummins L 450 1250 8.9 Liters 4.78 100 gal. Allison 3000MH 6 15 252+TAG Michelin 15000 15000 1500 56 12 17000 lb. 20000 lb. 12000 lb. 49000 lb. 64000 lb. 38100 lb. 10900 lb. 4018 Cummins L 450 1250 8.9 Liters 4.78 100 gal. Allison 3000MH 6 15 252+TAG Michelin 15000 15000 1500 56 12 17000 lb. 20000 lb. 12000 lb. 49000 lb. 64000 lb. 37800 lb. 11200 lb. 4054 Cummins L 450 1250 8.9 Liters 4.78 100 gal. Allison 3000MH 6 15 252+TAG Michelin 15000 15000 1500 56 12 17000 lb. 20000 lb. 12000 lb. 49000 lb. 64000 lb. 36400 lb. 12600 lb. 4310 Cummins L 450 1250 8.9 Liters 4.78 150 gal. Allison 3000MH 6 15 288+TAG Michelin 15000 15000 1500 52 12 19000 lb. 20000 lb. 12000 lb. 51000 lb. 66000 lb. 40600 lb. 10400 lb. 4311 Cummins L 450 1250 8.9 Liters 4.78 150 gal. Allison 3000MH 6 15 288+TAG Michelin 15000 15000 1500 52 12 19000 lb. 20000 lb. 12000 lb. 51000 lb. 66000 lb. 38500 lb. 12500 lb. 4326 Cumminsw L 450 1250 8.9 Liters 4.78 150 gal. Allison 3000MH 6 15 288+TAG Michelin 15000 15000 1500 52 12 19000 lb. 20000 lb. 12000 lb. 51000 lb. 66000 lb. 40700 lb. 10300 lb. 4328 Cummins L 450 1250 8.9 Liters 4.78 150 gal. Allison 3000MH 6 15 288+TAG Michelin 15000 15000 1500 52 12 19000 lb. 20000 lb. 12000 lb. 51000 lb. 66000 lb. 40600 lb. 10400 lb. 4362 Cummins L 450 1250 8.9 Liters 4.78 150 gal. Allison 3000MH 6 15 288+TAG Michelin 15000 15000 1500 52 12 19000 lb. 20000 lb. 12000 lb. 51000 lb. 66000 lb. 40300 lb. 10700 lb. 4363 Cummins L 450 1250 8.9 Liters 4.78 150 gal. Allison 3000MH 6 15 288+TAG Michelin 15000 15000 1500 52 12 19000 lb. 20000 lb. 12000 lb. 51000 lb. 66000 lb. 40700 lb. 10300 lb. 4369 Cummins L 450 1250 8.9 Liters 4.78 150 gal. Allison 3000MH 6 15 288+TAG Michelin 15000 15000 1500 52 12 19000 lb. 20000 lb. 12000 lb. 51000 lb. 66000 lb. 40700 lb. 10300 lb. 4002 Cummins L 450 1250 8.9 Liters 4.78 100 gal. Allison 3000MH 6 15 252+TAG Michelin 15000 15000 1500 55 8 17000 lb. 20000 lb. 12000 lb. 49000 lb. 64000 lb. 37700 lb. 11300 lb. 4018 Cummins L 450 1250 8.9 Liters 4.78 100 gal. Allison 3000MH 6 15 252+TAG Michelin 15000 15000 1500 55 8 17000 lb. 20000 lb. 12000 lb. 49000 lb. 64000 lb. 37700 lb. 11300 lb. 4054 Cummins L 450 1250 8.9 Liters 4.78 100 gal. Allison 3000MH 6 15 252+TAG Michelin 15000 15000 1500 55 8 17000 lb. 20000 lb. 12000 lb. 49000 lb. 64000 lb. 36800 lb. 12200 lb. 4310 Cummins L 450 1250 8.9 Liters 4.78 150 gal. Allison 3000MH 6 15 288+TAG Michelin 15000 15000 1500 55 8 19000 lb. 20000 lb. 12000 lb. 51000 lb. 66000 lb. 40800 lb. 10200 lb. 4311 Cummins L 450 1250 8.9 Liters 4.78 150 gal. Allison 3000MH 6 15 288+TAG Michelin 15000 15000 1500 55 8 19000 lb. 20000 lb. 12000 lb. 51000 lb. 66000 lb. 38600 lb. 12400 lb. 4326 Cumminbs L 450 1250 8.9 Liters 4.78 150 gal. Allison 300MH 6 15 288+TAG Michelin 15000 15000 1500 55 8 19000 lb. 20000 lb. 12000 lb. 51000 lb. 66000 lb. 40600 lb. 10400 lb. 4328 Cummins L 450 1250 8.9 Liters 4.78 150 gal. Allison 3000MH 6 15 288+TAG Michelin 15000 15000 1500 55 8 19000 lb. 20000 lb. 12000 lb. 51000 lb. 66000 lb. 40500 lb. 10500 lb. 4362 Cummins L 450 1250 8.9 Liters 4.78 150 gal. Allison 3000MH 6 15 288+TAG Michelin 15000 15000 1500 55 8 19000 lb. 20000 lb. 12000 lb. 51000 lb. 66000 lb. 40400 lb. 10600 lb. 4363 Cummins L 450 1250 8.9 Liters 4.78 150 gal. Allison 3000MH 6 15 288+TAG Michelin 15000 15000 5000 55 8 19000 lb. 20000 lb. 12000 lb. 51000 lb. 66000 lb. 40600 lb. 10400 lb. 4369 Cummins L 450 1250 8.9 Liters 4.78 150 gal. Allison 3000MH 6 15 288+TAG Michelin 15000 15000 1500 55 8 19000 lb. 20000 lb. 12000 lb. 51000 lb. 66000 lb. 40600 lb. 10400 lb.